Hello everyone!! Hope you have had a fantastic week so far. Also, thanks so much for those who played along last week. We have a New Challenge for you today and it is Black and White! 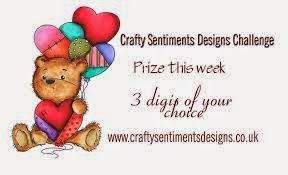 Remember, you can use any products you like on your challenge submissions, but if you use a stamp, digi image or die from CRAFTY SENTIMENTS DESIGNS your entry will be counted 3X for purposes of our random.org winner's draw!! Make sure you put a “3” after your name. 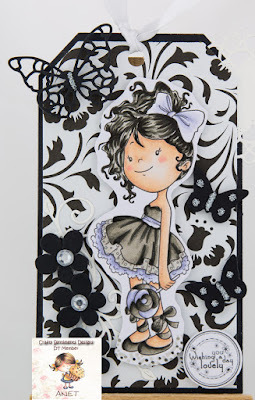 Also, a if you are or become a follower of our Inspiration Blog CRAFTY SENTIMENTS INSPIRATION BLOG, add a 3 after your name. That means if you used an image or die from our CRAFTY SENTIMENTS DESIGNS shop and follow CRAFTY SENTIMENTS INSPIRATION BLOG, you can add 6 after your name, which gives you 6x entries!! You have until Monday, November 2 at 9pm GMT to join in the fun.